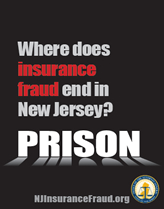 Who Commits Insurance Fraud in NJ? "With possible exception of murder and drug abuse, no serious crime attracts as wide a variety of perpetrators as insurance fraud. People who would never think of robbing a bank, stealing a car or burglarizing a home can find the temptations of "easy money" from insurance fraud hard to resist. The files of the Office of Insurance Fraud Prosecutor demonstrate that Insurance Fraud is crime committed by people in a wide range of occupations." Note - This list is not all inclusive. There are many other instances of insurance fraud and crimes not highlighted here. It's illegal for doctors, medical facilities, chiropractors, etc. to overbill for treatments, or to bill for treatments not provided. It's illegal for people to stage car accidents to bilk or cheat insurance companies. These are all violations of the Health Care Claims Fraud Act. It's illegal to make or sell a fake motor vehicle insurance card. This is a violation of N.J.S.A. 2C:21-2.1a. Punishable by up to 18 months in jail and a $10,000 fine. Also, a person convicted is required to perform 30 days of community service. It's illegal to submit a false claim form to an insurance company in order to be paid for health care services which were not received or provided. So if you don't live in New Jersey...don't try to insure your car here! It's illegal to make an oral or written statement which is false or misleading in order to obtain insurance (such as home, health, life or automobile insurance). So tell the truth to your insurance agent and on your application! Licensed professionals who violate the insurance laws, from electricians to lawyers, may lose their State licenses! In addition to possible criminal penalties, a person violating the insurance laws may be required to pay a civil penalty of up to $5,000 N.J.S.A. 17:33A-5. It's illegal to participate in a scheme to offer or receive kickbacks in connection with the furnishing of items or services which are billable to the Medicaid program. It's illegal to over bill Medicaid for services provided. It's illegal to receive more Medicaid benefits than you're entitled to. These are violations of N.J.S.A. 30:4D-17. Punishable by up to 3 years in prison and a $10,000 penalty. It's illegal to receive these benefits if you are not disabled and can really perform the functions of your job. To do so is considered theft. It's illegal to collect unemployment benefits while you are working. This is theft from the State unemployment insurance fund. If you steal over $500 you can go to jail for 3 to 5 years and be required to pay a fine of up to $15,000. Theft of more than $200 is punishable by up to 18 months in jail and a $10,000 fine. Theft of $75,000 or more is a second degree crime, punishable by 5 to 10 years in prison and a $150,000 fine. It's illegal for an employer not to purchase workers' compensation insurance. Failure to purchase workers' compensation insurance violates N.J.S.A. 34:15-79.